This page contains database backup settings, automatic backup schedule and a list of available backups. Backup to is the directory where the backup files will be stored. We recommend changing the default value of this setting. The idea is to store database backups on the dedicated physical drive. Besides being a common practice aimed at reducing risk of information loss due to hardware failures, it will also separate read and write disk operations during backup, and increase backup speed / decrease load for the main drive. Time and periodicity settings on the Schedule tab define schedule for automatic backups. 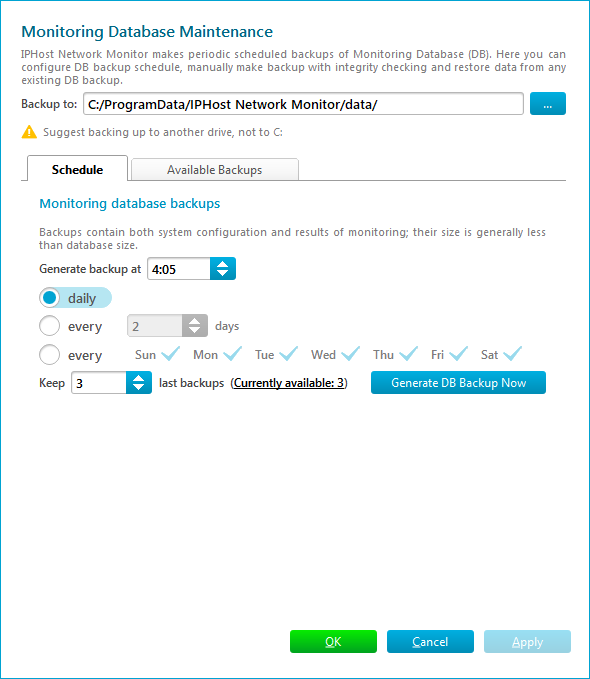 When backup is successfully created, old backups which are not pinned will be removed if their count exceeds the value set by the Keep N last backups setting. You can click on Generate DB Backup Now button to start database backup immediately. Available backups table contains all backup files found in the backup directory. A backup is known good if DB integrity check that takes place when backing up the database had succeeded. Other backups are marked in red. Pinned backups are not deleted automatically. You can preserve any number of them for as long as you need. Table rows for them use green background. 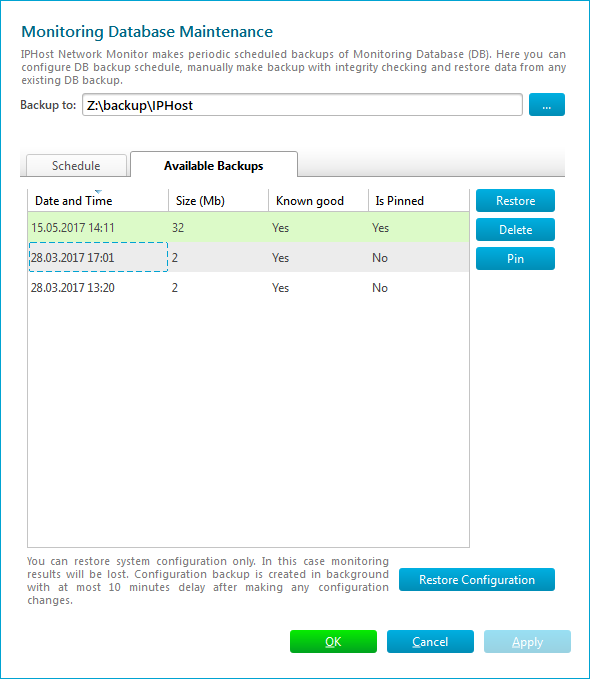 Click on restore button to restore monitoring database from the selected backup. This will temporarily suspend monitoring, restart IPHost Network Monitor Client and overwrite your current database contents. 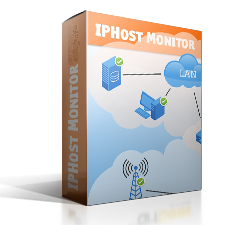 IPHost Network Monitor creates a configuration backup in background within 10 minutes after making any configuration changes. This backup does not contain any monitoring results. In emergency situation you can restore the automatically backuped configuration by clicking Restore Configuration button. Note that ALL monitoring results will be lost.